About 6 weeks ago I was watching sports with my husband. I don’t remember what kind of sports – the point was to sit with him 🙂 Anyway, we have this big ol’ TV that we bought when we built the house 11 years ago, and we thought we were so smart to have a cabinet made to fit. The doors would close and no one would know there was a TV there. Right. I’m the only one who closes the doors, and that cabinet is for Old School TVs, not flat screen. But I digress. I was staring at the screen and realized that I couldn’t read whatever numbers they had up there. I know my vision has gotten worse, but this was ridiculous. He explained that pictures are formatted for new wide screens, and when those images are broadcast on dinosaur TVs everything gets squooshed. You need to understand that I don’t watch much TV. A little Food Network while I iron and I’m good. My son watches ridiculous shows when he has time (which is seldome), and when my darling middle daughter is home from school, she and her dear friend watch those dreadful Lifetime channel movies (forgive me if I offend you). My husband likes to watch sports to unwind, and with his schedule and the pressures he faces at work he deserves it. I looked at those little tiny athletes running around and said “maybe it’s time to get a new TV”. This was a huge statement, because it meant removing an entire wall of cabinetry, which sets in motion new flooring, paint…you get the picture. We had a couple of conversations over the next couple of days and I told him to start shopping. A day or two later he came to me with a suggestion that knocked my socks off. He said “I’ve been thinking about those cabinets on the wall with the TV. Wouldn’t they make good storage in your stamping room?” Honest to goodness, that was never my intention when I suggested the new TV but WOW! It made sense! I’ve been using my oldest daughter’s bedroom for a stamp room. I finally got rid of the bed about 6 months ago, and that opened up a lot of space, but I’ve been working with a tiny little desk, a 6 foot folding table, some shelves and a chest of drawers. I’m not complaining – I know there are loads of stampers who would LOVE to have half this space – but it hasn’t exactly been custom. Now I’m dreaming. It’s kind of overwhelming, especially because we are in post-Christmas chaos. There are boxes of stuff that I don’t know what to do with – you know the sort – photos and mementos from travel and retired stamps/embellishments/papers that didn’t sell. We’re going to switch bedrooms and make the current stamp room into the guest room, so it promises to be exciting, chaotic and messy. First off, go stay in a hotel while you do the remodel. lol I finished my kitchen/living room makeover this summer. What chaos! Put in storage in the search box of the showcase on that site and all kinds of ideas come up. Anne, enjoy dreaming and creating your new craft room!! Sounds like a great plan. I like to have everything out so that I can see what I have. I love the storage that Kim has for her paper. I have never seen this type of unit that 8 1/2 x 11 paper would fit in but think it would be great to have so that scraps can be stored with the full sheets. It also protects paper from dust and from fading. If you have space and the funds, slat wall is great. Don’t make any snap decisions! Think about how you use your supplies and what will work for you. 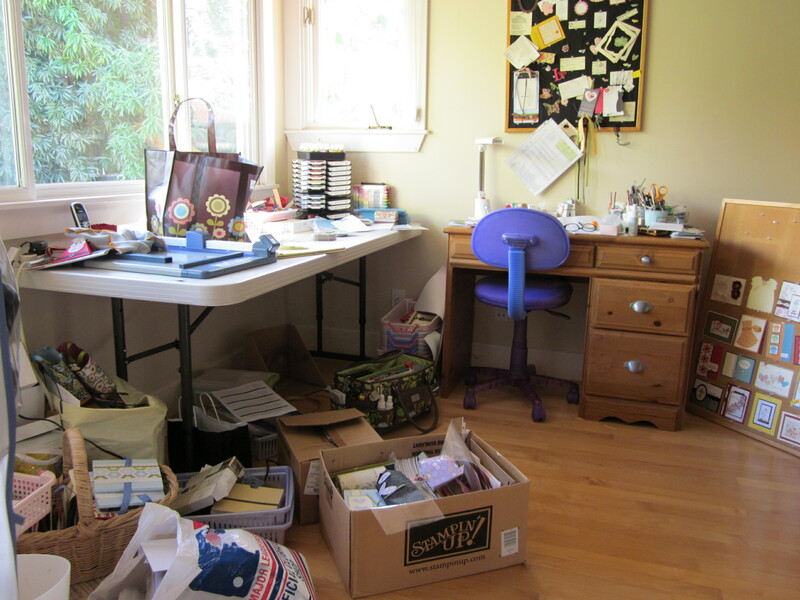 Have fun and be sure to post pictures of your new scrap room in progress and when finished.